I enjoyed Port Royal the first time I played it – and the second time, and the third time, and so on. It's got pirates, which is never a bad thing, but what it's really got is that Euro vibe of building an economic engine. However, play is way simpler and faster than, for instance, Puerto Rico . . . without ending too quickly. In terms of play time, the game hits the sweet spot for me: about a half-hour, sometimes less. 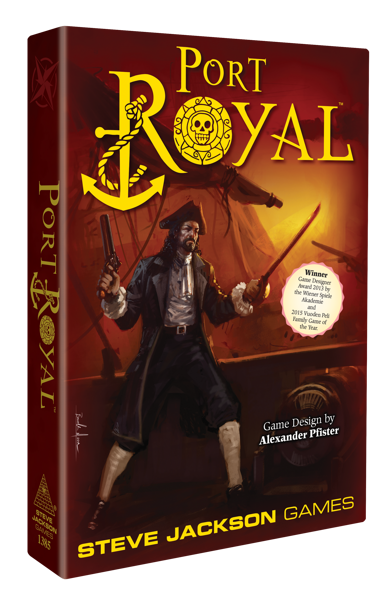 Also in the Euro style, Port Royal rewards attention to your opponents, but has no direct headbashing assaults. You can do things to inconvenience the other players, especially the one to your left, but it's definitely you vs. the deck, and not at all "screw your buddy." A central mechanic is "push your luck." But by putting the right cards in play, you can insure – to a point – against bad draws. The balance between skill and luck is good. You usually have the opportunity to play, in a small way, on each opponent's turn, so you don't sit there drumming your fingers and waiting for your own turn. 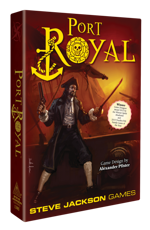 On the whole, then – if you like the Euro style of game design, I expect you will like Port Royal. It didn't win those awards by accident, and we're proud to be able to bring it to you in English. Thank you, Alexander Pfister, for a great game. PS - Tom Vasel reviews the game here.